A novel of San Francisco. On the eve of the fortieth anniversary of the Summer of Love, Helen and Frank Connor arrive in San Francisco to determine the fate of their marriage. A series of unexplainable events sends the couple in separate directions deep into the ghosts of the City's past, which include the fierce, fiddle-playing Elle, who accidentally jumped to her death in 1967 and is now back to reclaim her lost instrument, pulling along with her all the men who stopped their lives for her. 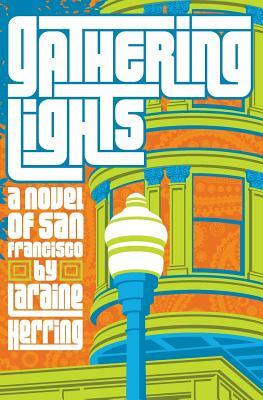 This ensemble novel is peppered with classic San Francisco characters like Remmy X, an old hippie poet who publishes a daily paper on his old Remington; Brian, haunter of the City Lights Bookstore, who fell in love with Elle in 1967; Penny Lane, the drag queen of North Beach; and Shep, Remmy's faithful dog. Gathering Lights is a ghost story of five souls suspended in the amber of their grief, and it will have you believing in the power of love and music to change both the past and the future.